I have to admit, I'm feeling pretty good about myself right now. I had a super special awesome weekend attending my first Quilt Market! Yeah, yeah, I know hundreds of people go to Quilt Market every season, but forget about them. THIS IS MY MOMENT. Prior to Market, I was anxious about being seen a "quilt noob," having only been quilting since this past January. However, within hours of putting my badge around my neck, I was milking that fact. 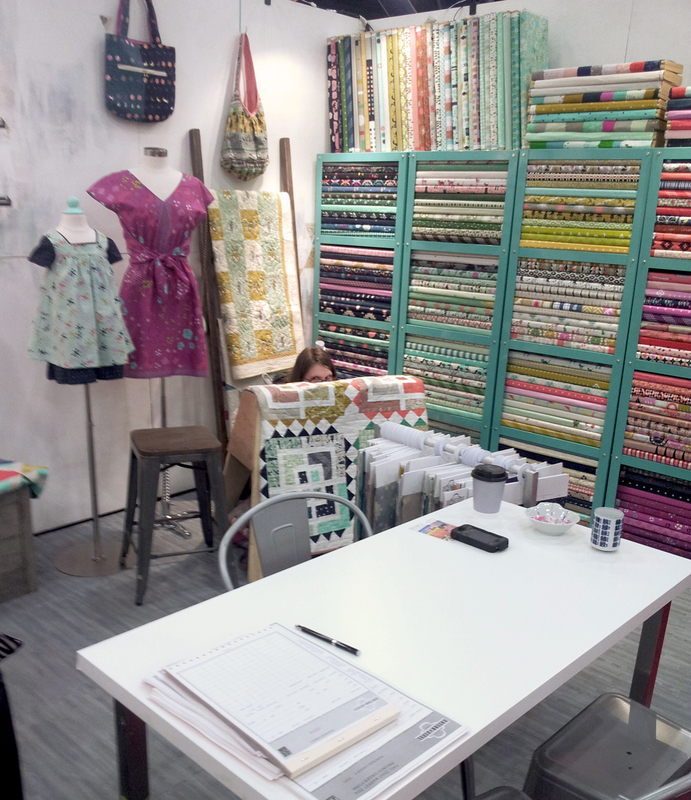 It's all I could do not to jump on the throne-like chair in Tula Pink's booth and shout "I've been quilting for less than a year, and now I'm here! ARE YOU NOT IMPRESSED?!" Okay, maybe I'm exaggerating a bit. I did feel way more cool and confident than I do in my everyday life, probably because being surrounded by so many people with the same passion is just so damn exhilarating! 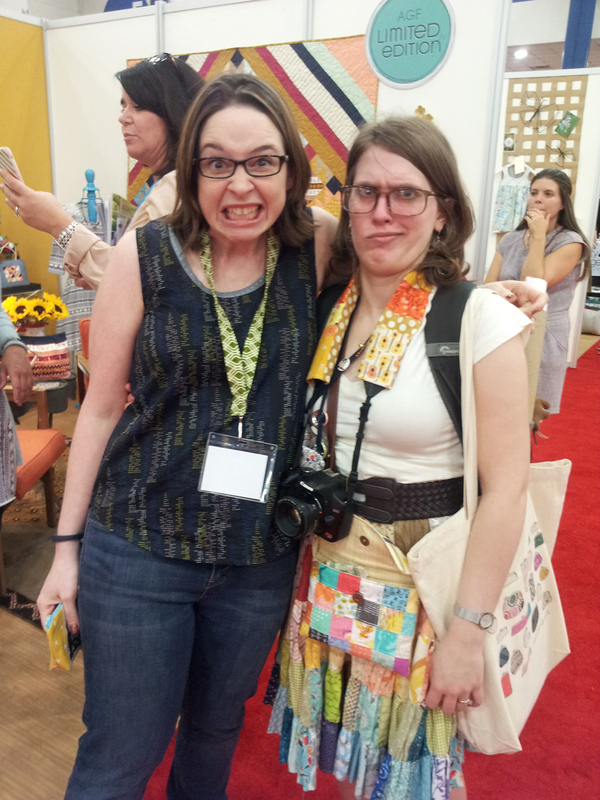 Since I have so many things to say about my first Quilt Market experience, I'm going to break things down into a few posts. This one is going to be about ME and my adventures: funny/cool crap I saw, did, and heard. 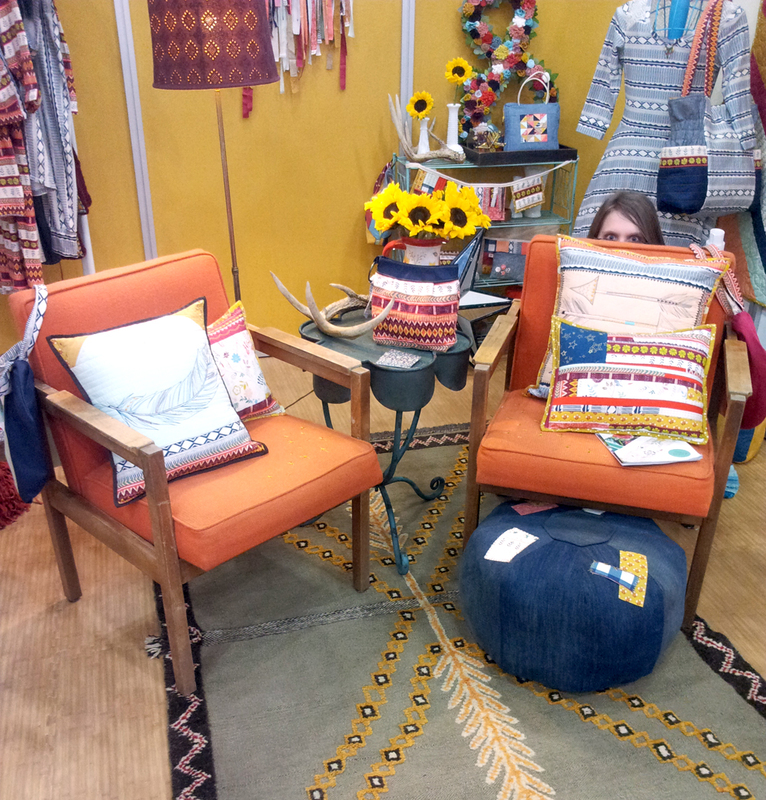 Next, will be a recap of my personal Market favorites: the booths, the samples, and the fabric! I'll do a more detailed post about my Sample Spree experience along with advice for anyone considering (or fearing) the madness. Last, I'll do a post about what I'm glad I did/brought to Market, and what I would do differently next time. Now, onto the adventures! On Friday, I drove to Market after work at 5pm, which royally sucked thanks to Houston traffic. On the bright side, I arrived shortly after 6pm in time for the Fabric 2.0 Meet & Greet. There, I proceeded to shout "OH MY GOD!" at point blank range in Katy Jones' face. Damn it. Keep it together, you spaz! After I got my sh*t together, I bumped into Stephanie of the Modern Sewciety, AKA my morning commute DJ. 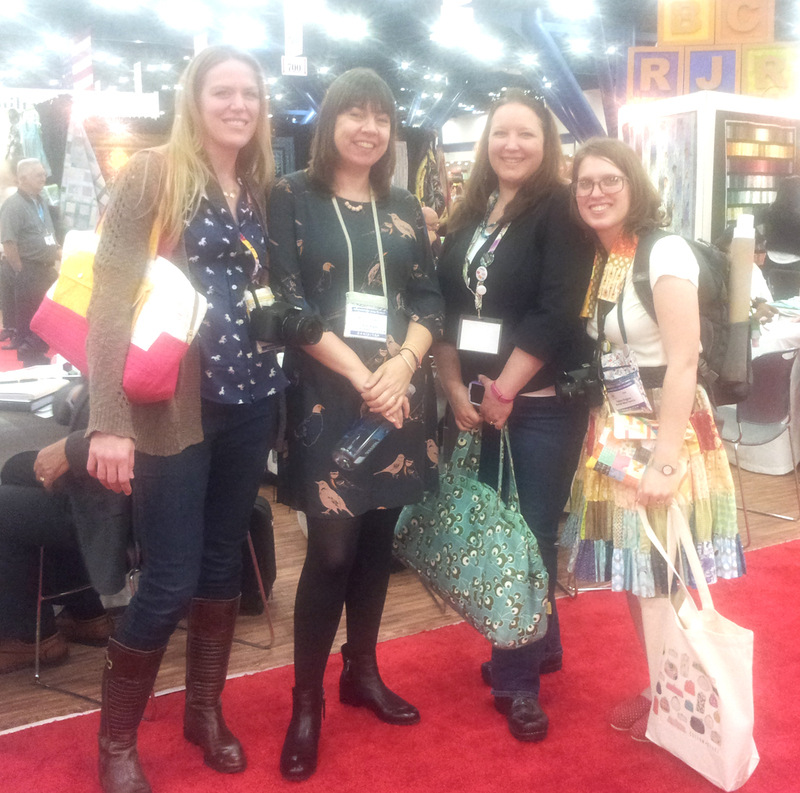 I probably spent the most time talking to the super fun mom and daughter pair Jill and Jamie of Sunflower Quilts. After I mentioned I didn't see any (personally) familiar people in the room, Jamie literally yanked Angela Walters out of her conversation circle to introduce us! After a couple hours of drinks and fun, I dashed to join the end of the line for Sample Spree, where I met Heather Peterson of Girl Charlee. She guided me into the heart of darkness and cash was spent! Don't worry, you'll be able to read about the Sample Spree Spoils soon. On Saturday, Tammy and I carpooled because I'm phobic of downtown driving. So I had that going for me. 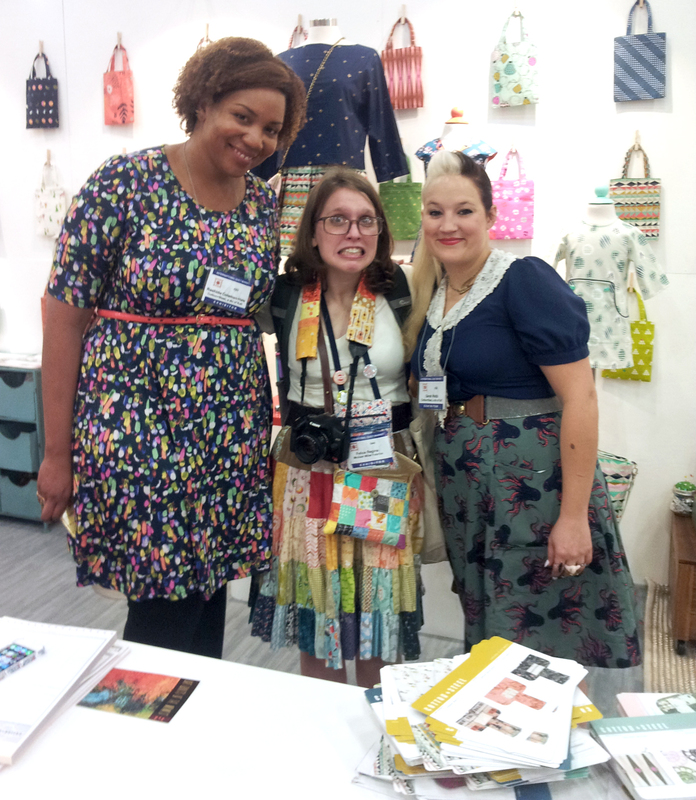 We met the awesome ladies at Cotton + Steel including one of my mostest favoritest designers ever, Sarah Watts. We talked with Kim Kight for wayyyy too long, but she's just too easy to talk to. 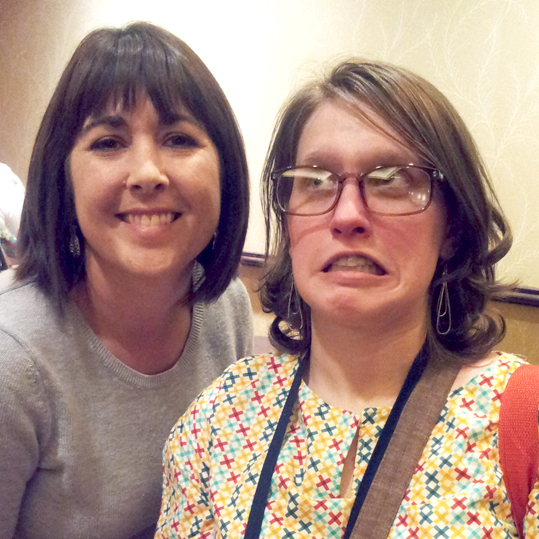 I also met a pretty spiffy gal who works with the Cotton + Steel gang: Abbey, Melody's assistant. She was the first person I've ever met who knew about the hilarious Hipster Thanksgiving video that I love to quote. It was exquis'. And she didn't judge me for stroking the double gauze a few strokes too many. 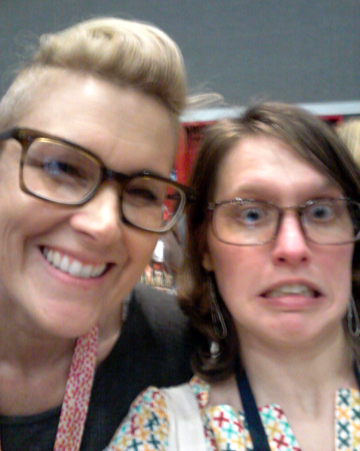 Everyone in HMQG has been saying Jacey and I need to meet so we can unite our powers of snark and stupid faces. So we did. I got two little baby succulents from Heather Givans of Crimson Tate who may have been the only person who had more excitement over Market than I did. Seriously, she could power a city with her energy. We played a silly Instagram game called #FindFelice. I hope this will be a Quilt Market tradition. We went to a couple parties after Market, where I road the stagecoach to funky town... and would talk to anyone who stood still, like the Gina Pina crew...for like two hours. All in all, it was a super fun first Market experience! I can't wait to do it all again! Are you going to be at the festival meet-up? I'll be at the meet up! Thanks girl :) see you Saturday! seriously. this is why we all heart you so much! What a fun experience! I'm also curious to know what you need to get a badge. It seems to indicate you have to either be a retailer, manufacturer, or "industry professional." 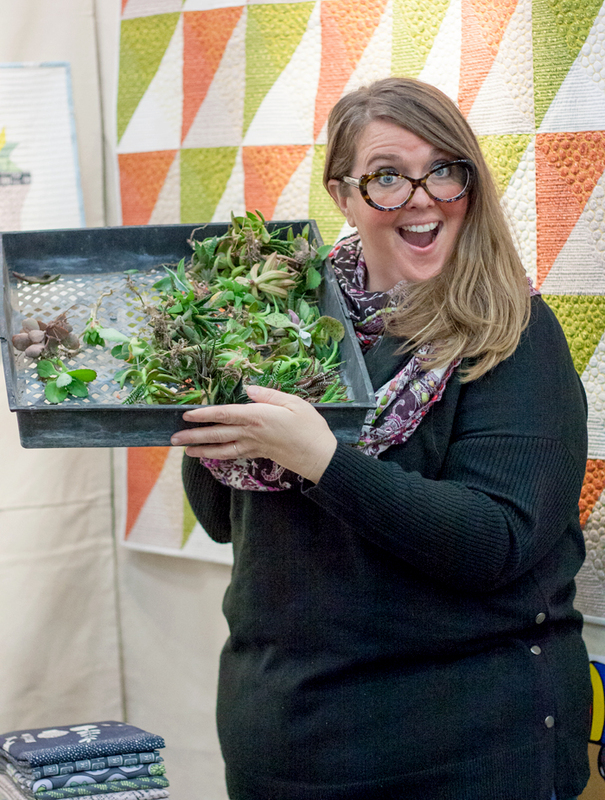 What if you're just an enthusiastic quilter like me? I posted the link with the specific info above in response to Hillary's comment. Thanks! Yeah I read the requirements at that link. Guess I've got some work to do to make myself more "legit" if I want to ever go! Fall 2014 Quilt Market: My Favorites!